There's an abundance of female-fronted symphonic metal bands. This we all know. You can line them up like so many dotless dominoes as the similarities abound. With one stroke of your hand, they fall into a familiar heap. Some are better than others, others not so much. Sirenia has always been one of the better ones if only for their consistency. Alternatively, they're not much different from their peers. Elaborate arrangements which are bombastic via riffs and synth orchestration. Yup. Ethereal and operatic female singer you can barely understand. Check. Some dude throwing in some death vocals here and there. Duh. Everything basically sounding somewhere between epic and pompous. No doubt. So what sets Sirenia apart? Therein lies the conundrum. Reading the above, the answer would be not much. But some things are notable. One is that the male death vocals are basically drowned out by the riffage and orchestration, and that's a good thing. But begs the question. Why bother in the first place? Another fine point is Morten Veland's guitar lines. Like the immensity of the Sirenia sound, when he rips off a lead it can be pretty damn awesome. The second half of Earendal and Once My Light have some terrific stuff, by example. But the best example is Elixer, a totally riff driven groove monster, and also immensely catchy. It's the best song here, and likely the only one that doesn't blend in with everything else. Otherwise, Veland's leads are rather sparse throughout, and that's a disappointment. 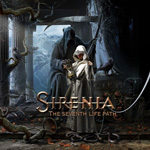 All this said, when it comes to female-fronted symphonic metal, Sirenia remains a constant and consistent one (read: more of the same), and The Seventh Life Path merely another example of their presence and power in the genre. 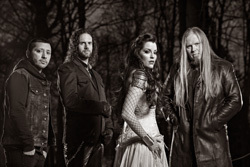 When it comes to female-fronted symphonic metal, Sirenia remains a constant and consistent one, and The Seventh Life Path merely another example of their presence and power in the genre.